The boys and I are about to receive the best Valentine's day present ever. Lucy should be leaving Colorado sometime late today, to arrive at the 7MSN sometime Tuesday. I'll update the twitter feed at the bottom of this page as I hear from the transporter...assuming I can remain calm enough to type. 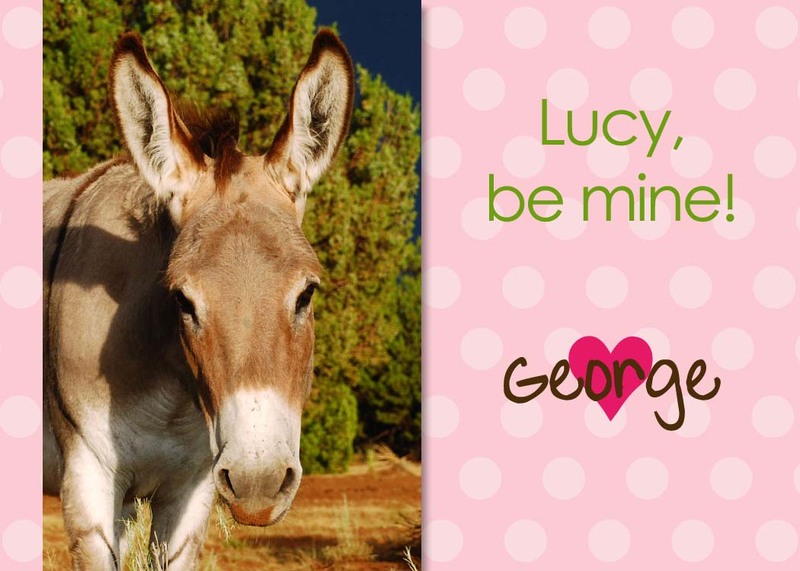 Meanwhile, the boys are jockeying for position to be Lucy's valentine. Valentine card templates from MCP Actions. WOW, this is SO exciting! 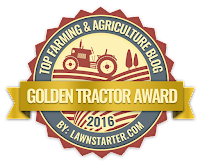 I bet you are besides yourself, and you got the new pasture ready just in time! The boys Valentine's are so cute, how could she refuse any of them? Looking forward to Lucy's arrival. My money's on Hank - tall, dark and spotted - whoohoo! Ah ha ha! How will she ever choose?!! Oh, how exciting! I can't wait for tomorrow's post! All your boys are so handsome! What wonderful news for you all! I'll keep my fingers crossed for a safe and uneventful journey. The good news is that Lucy couldn't have any better weather for her trip. Happy Valentines day to all your boys. May the best man win Lucy's heart. You are too funny...cute Valentines! I know you are so excited to get your Lucy and I can't wait to see and hear all about her when she arrives to her new family at the ranch! How cute!! Love the valentines from the "men". I am so excited for you!!! I can't wait to see what the boys think when she arrives. How is Lucy going to select-hum? They are such handsome boys and loaded with loving personality. What's a girl to do? Can't wait for Lucy to arrive. We are having glorious warm weather here in Colorado. It's a perfect time for the arrival of a new family member. Lucy is probably thinking... So many men, so little time. I have a feeling she's going to love all three of those handsome fellas! Safe travels Lucy - Linda, I look forward to very happy times as this new journey begins! HVD! Yipee! Looking forward to meeting Lucy. This is going to be great!! I agree with Lucy...you just can't trust anything over the Internet!!! I can't wait to hear more about her arrival. I know we'll see lots of pics. Oh the boys are just so darn cute! Lucy is one lucky girl. 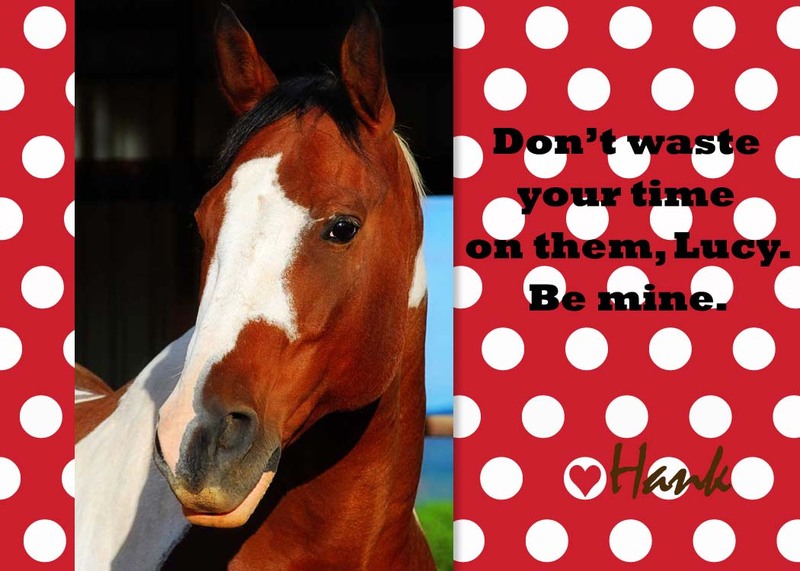 Happy Valentines Day to all at the 7MSN Ranch. I can't wait for Lucy to get here! Since I made my husband watch the Lucy video, now he comments about riding donkeys. We'll be tuning in daily. Well I am am totally excited about Lucy arriving! I can't wait to see posts about her. Love the Boys' valentines....Adorable! Love Hank's card the best. Can't wait to see Lucy! It is going to be a long day waiting for news of Lucy's arrival and meeting her new family! This is so exciting. We are all waiting to help you welcome the new girl! How exciting! Lucy is going to have a hard time choosing she's got lots of handsome guys vying for her love. Such exciting news! I can't wait to see and hear more. Happy Valentine's Day to all at 7MSN! OMG, how could Lucy possibly choose amongst such handsome fellas?! I'm tickled pink for you and the boys on Lucy's soon-arrival! what a great valentines present. I can not wait to hear of Lucy's arrival. What a bunch of sweeties. Lucy is a lucky woman!! How exciting! I'd be squirming waiting for news if it were I.
I wonder if Lucy will just play the field or what? Make those boys work for her affections. It will be fun to see her personality and how it affects your herd. Laughing at Hank's valentine. He has such a GREAT stud muffin look on his face!!! Cute, and congrats. What exciting news. That lady is in for a treat when she gets to her new home - I wish I had four hunks vying for my attention! haha. Such exciting news! Lucy will love all the boys - how could she not? George and Alan are precious, but Hank is quite the looker! Can't wait for the new chapter to begin! Happy Singles Awareness Day Boys! See how many blog readers can´t wait getting to know you! I have to say, Hank is looking My-T-Fine in that picture. Oh, this is crazy exciting!!! I hope you and your lovesick puppies can all sleep tonite! What a fabulous Day After Valentine's present this is going to be!!! Smooch will be watching out the window all day tomorrow. I hope Lucy likes beautiful porcine princesses. Up on my tippy toes, waiting!!! Lucky Lucy- she'll have all the boys attention! How exciting for you too. Hope Lucy has a safe trip. Fingers and toes crossed in a big heart that she arrives safe and sound in 7MSN Heaven! I am so excited for your new arrival! PS: okay....I was just thinking... those 3 head shots should be your next header. Not that you need any ideas for your headers b/c they are always amazing (even a couple of months ago when it made me shiver when I came to your page) but I just thought I would throw that out there. I'm giddy for you as the trip has been started. yee haw! 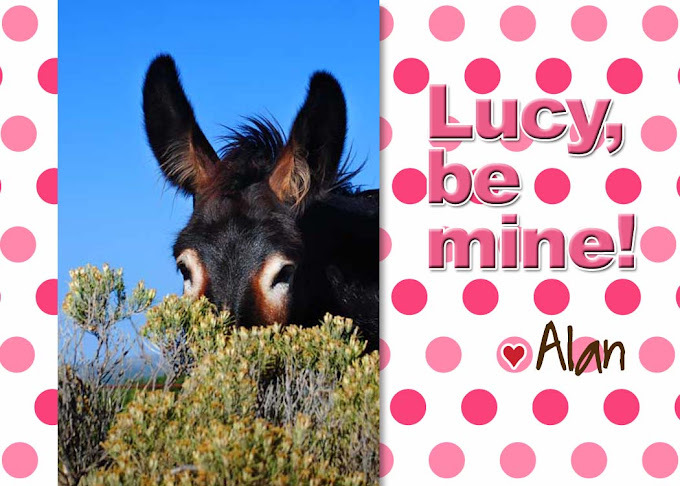 What a wonderful late Valentine Lucy will be!!! All of the boys look so handsome on their cards, but I agree with Lucy... online dating is tricky. Wishing her a great trip and wonderful weather on arrival! Won't it be fun to see who she hooks up with?